We’d love your help. Let us know what’s wrong with this preview of I Have Seen Him in the Watchfires by Cathy Gohlke. To ask other readers questions about I Have Seen Him in the Watchfires, please sign up. 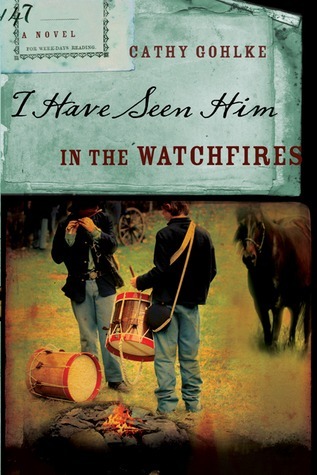 “I Have Seen Him In The Watchfires” is the sequel to “William Henry Is A Fine Name” and is just as brilliantly written. This time, instead of traveling north, Robert is traveling south in order to rescue his mother. He is also 5 years older and still an unlisted union soldier. Robert receives a letter from his cousin Emily begging him to visit her father who was captured during the battle of Gettysburg and is now incarcerated at the Fort Delaware prison on Pea Patch Island. While there he unwitt “I Have Seen Him In The Watchfires” is the sequel to “William Henry Is A Fine Name” and is just as brilliantly written. This time, instead of traveling north, Robert is traveling south in order to rescue his mother. He is also 5 years older and still an unlisted union soldier. Robert receives a letter from his cousin Emily begging him to visit her father who was captured during the battle of Gettysburg and is now incarcerated at the Fort Delaware prison on Pea Patch Island. While there he unwittingly becomes involved in a prison escape and is himself captured and treated poorly. Emily’s father, the very man he rode all that way to see, tricked and used him in the escape plan. An elderly couple, who had early assisted Robert, recognize him amongst the prisoners and garners his freedom and sends him on his way again in search of his mother. Robert is thought to be a Confederate spy on the run and is risking his life at every turn. He is angry with himself for not joining the Union and fighting against slavery when he turned eighteen like he had promised his father, Charles. But Robert soon learns that God’s plan and his are not always the same. Slavery is a terrible thing and comes in many different forms and finally has to learn to be a slave to Jesus Christ before he himself will ever be free. Robert learns “I know the plans I have for you”,” declares the Lord, “plans to prosper and not to harm you, plans to give you hope and a future.” He realizes he needs hope and a future and “...to trust someone.” That someone is God. Not only does Robert realize that his beloved country is divided, but so is his own family and he realizes that the rescue just might not be up to him but up to God. This was a touching, exciting, thought-provoking read and one I would highly recommend to anyone. I’m actually quite sad to see the story end and would have liked a third book to make this a trilogy! Excellent writing, excellent story-line...thank you Mrs. Gohlke! I'll review this, along with her first book, William Henry is a Fine Name, on my website blog soon. Visit annshorey dot com for my book review blog. Deeply moving conclusion to the two book series. I am sad to have this story end. It really stirred my emotions. Extremely well written and the characters came to life. The spiritual message was woven into the storyline seamlessly and was so uplifting. I'll admit that I put off reading these books since they are categorized as YA. The only reason I decided to read them is because I have read everything else by this author and wanted more. I'm so thankful, as I devoured them. I Have Seen Him in the Deeply moving conclusion to the two book series. I am sad to have this story end. It really stirred my emotions. I'll admit that I put off reading these books since they are categorized as YA. The only reason I decided to read them is because I have read everything else by this author and wanted more. I'm so thankful, as I devoured them. I Have Seen Him in the Watchfires is so touching and realistic, showing the tragedy of war as well as how important friendship and faith are. Interesting story line. I am always saddened by stories of the "Old South" and the Civil War. The lives of the people were so hard during that time - unimaginable. Ok, so first of all I would like to point out that when I registered to win this book I was unaware that it is by a religious writer (whether that be my fault for not clearly reading the synopsis or the person who listed this giveaway not making sure the fact is visibly noted, I'm not sure). Either way, had I been aware of that fact, I would not have registred for this book. That being said, I did win this book, and because I follow the rules, I read it. Though "I Have Seen Him in the Watchfire" Ok, so first of all I would like to point out that when I registered to win this book I was unaware that it is by a religious writer (whether that be my fault for not clearly reading the synopsis or the person who listed this giveaway not making sure the fact is visibly noted, I'm not sure). Either way, had I been aware of that fact, I would not have registred for this book. That being said, I did win this book, and because I follow the rules, I read it. Though "I Have Seen Him in the Watchfire" was fairly well written, I have to assume this book was geared more towards the young adult group. While the storyline is good, the main character, Robert, seems to lack emotional maturity. Also, while the book is set in the middle of the Civil War, the greatest conflict ever to touch this country, the writer seems to gloss over anything involving the actual war itself. The premise of the book is that Robert, a 17-going on 18-year old is living in a Northern state, while his mother had gone back to her family home in the south several years prior to the beginning of the war and his father has recently joined the Union army. He promises his father that he will not enlist until he turns 18. When he is 17, he receives a letter from his cousin in the South (whom he, incidentally, is in love with) requesting that he visit his uncle who is being held in a Union prisoner camp. During these visits, his uncle is able to help his men plan an escape from the camp before he dies, and Robert is taken away with them. He is left behind in town with a sympathetic family and a crippled Confederate soldier named Wooster. While Robert is dilirious with fever, Wooster smuggles them out of town before they can be found. They end up in a Confederate army hospital, only to find the Captain who left them for dead is on his way. Again, they manage to leave just in the nick of time, heading south to bring Wooster home and Robert to his family. I say many things about the war are glossed over because, while there is no actual fighting--Robert is not actually a soldier, Wooster recalls his time in the battle of Gettysburg with so little emotion that its very difficult to beleive he was actually there. And Robert, who we learn helped smuggle a slave boy from his grandfather's plantation, just does not seem to have the emotional maturity at 17 of someone who would actually have done such a thing. The story plods along, while we listen to the thoughts going through Robert's head, witnessing him narrowly escape capture several times, only to find himself finally with his mother who is in the throws of a mental breakdown. Or is it some sort of disease like Alzheimer's? I have no idea. Her mind is confused and she wanders in and out of the present like someone who may have that, but its very hard to tell where the writer was going with that. Suffice it to day, mom has issues. This then leads Robert to have his Glorious Epiphany about how he should just trust in God and do whatever it is God has set before him to do (because we didn't see that coming at all). Slavery comes in many forms. I couldn’t wait to read the sequel to William Henry is a Fine Name, and Cathy Gohlke didn’t disappoint. I Have Seen Him in the Watchfires hooked me from page one. Not yet eighteen (which is old enough to enlist) Robert Glover bides his time at home in Maryland. Pa has gone off to the Civil War and his mother has been living the past five years at her childhood home in North Carolina. A letter from Robert’s cousin, Emily, begs he visit her father, a Confederate colonel Slavery comes in many forms. Not yet eighteen (which is old enough to enlist) Robert Glover bides his time at home in Maryland. Pa has gone off to the Civil War and his mother has been living the past five years at her childhood home in North Carolina. A letter from Robert’s cousin, Emily, begs he visit her father, a Confederate colonel who’d been captured during the battle of Gettysburg. Unbeknownst to Robert, her father uses him to pass secret information to his men, helping them escape the prison. Now thought to be a Confederate spy, Robert is on the run. He heads for North Carolina, hoping to get to his mother and cousin and be of use. But war has ravaged the land, and Robert is in danger at every turn. He berates himself for not joining the Union and fighting against slavery like his Pa and other young men his age, but he learns that his plans are not always God’s plans. As Robert cheats death again and again, he discovers slavery comes in many forms and only by becoming a slave to Christ will he ever be truly free. This was a second book in a sequel, but it can be read out of order if you have not read the first. Robert is a young man who has wanted to join the fight for his country during the Civil War but has kept his promise to his father to stay and help with the farm while his father has gone off to fight. He receives a letter from his cousin begging him to visit her father who is in prison having been captured in the battle at Gettysburg. When visiting his Uncle he is tricked into helping with a priso This was a second book in a sequel, but it can be read out of order if you have not read the first. When visiting his Uncle he is tricked into helping with a prison break. He finds himself then on the run for his life and is angry with himself for not joining the army and fighting against slavery like his father and others that he knows. In all of this he learns what if means by Honor and duty to God and Country really means. Sometimes we just don't understand what is expected of us and if we are doing what we should. I found this really a wonderful book and read. Would recommend it. I very much enjoyed Ms. Gohlke's writing style, and although the subject being slavery is enough to infuriate anyone with a heart, the story was well written and made a point. William Henry and his grandmother are two characters who will not be forgotten quickly. They are slaves on Robert's grandfather farm . Robert is a 13 years old in 1859 and is best friend's with William Henry. Miz Laura, is a woman after my own heart. She will fight for what she believes to be true, and she does this throug I very much enjoyed Ms. Gohlke's writing style, and although the subject being slavery is enough to infuriate anyone with a heart, the story was well written and made a point. William Henry and his grandmother are two characters who will not be forgotten quickly. They are slaves on Robert's grandfather farm . Robert is a 13 years old in 1859 and is best friend's with William Henry. Miz Laura, is a woman after my own heart. She will fight for what she believes to be true, and she does this through prayer and standing her ground against the white library ladies. Best book I've read in some time. So well written. I love how this book shows how brother could fight brother in the Civil War. Demonstrates the complexities of relationships in families split by the issues of the war. There is honor, respect, heartbreak and sorrow wound all through the story. I had not previously read the book that was written before this, Henry is a Fine Name. Yet, I don't feel like I missed a beat in this story. Now i'm off to read it. I had a really hard time getting through this book. It is a sequel so maybe I would have enjoyed it more had I read the first book. I found the main character, Robert, tepid. The story itself was drawn out and often preach-y. If someone was heavily interested in the Civil War they might be drawn in, but I certainly wasn't. This sequel to William Henry is a Fine Name looked at the Civil War years from the soldier's view and even Prisoner Camps. The story was so different from what I expected ... But I really liked it! If you want new insights into Civil War, don't miss this 2 book series! Well done, Cathy Gohlke! Heartbreaking, but realistic, story. I still have a hard time with the mother. I want to shake some sense into her. I like this book. It held my attention. I wasn't aware that it was written from a biblical perspective until I was well into it. It didn't really overwhelm me from that perspective. I really enjoyed the book from the start, although towards the end it just resolved every little issue, which was unrealistic. Still a very good book. This was a thought-provoking book that took an alternate look at the Civil War from the viewpoint of a young man confused with his purpose and the world in general. I really liked this book and the perspectives of the characters. Nice little twist towards the end there! Interesting book about a boy and towards the end of the war. Would be a great HS reading list book. This book was about the brutality of the civil war, and about a boy who is trying to find his family but runs into some trouble on the way. Cathy Gohlke is the three-time Christy Award–winning author of the best selling and critically acclaimed novels The Medallion, Until We Find Home, Secrets She Kept (Christy Award; INSPY Award); Saving Amelie (INSPY AWARD); Band of Sisters; Promise Me This (listed by Library Journal as one of the Best Books of 2012); I Have Seen Him in the Watchfires (Christy Award, American Christian Fiction Write Cathy Gohlke is the three-time Christy Award–winning author of the best selling and critically acclaimed novels The Medallion, Until We Find Home, Secrets She Kept (Christy Award; INSPY Award); Saving Amelie (INSPY AWARD); Band of Sisters; Promise Me This (listed by Library Journal as one of the Best Books of 2012); I Have Seen Him in the Watchfires (Christy Award, American Christian Fiction Writers Book of the Year Award and listed by Library Journal as one of the Best Books of 2008) and William Henry Is a Fine Name (Christy Award).